“Can you get May 5th off of work?” my boyfriend texted me. “I think so, why?” I responded. 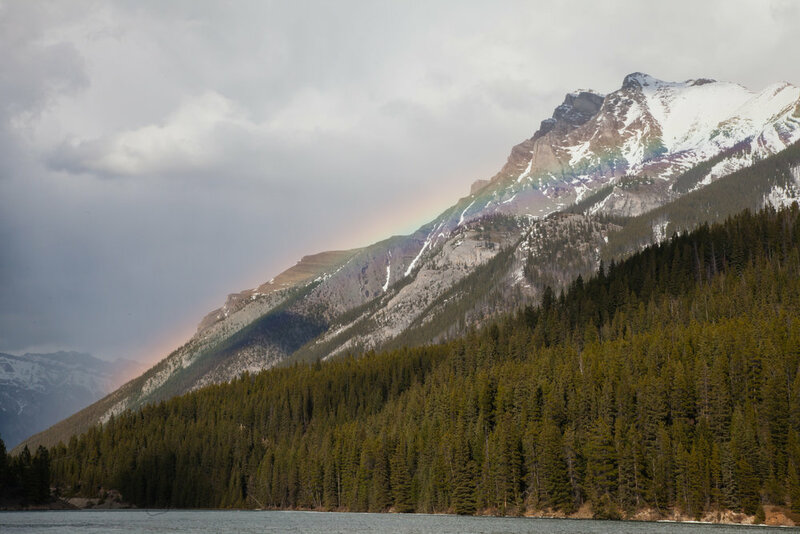 …and that’s how my surprise birthday trip to Banff started! It technically only remained a surprise until a couple of weeks before. He had to tell me where we were going because he had no idea what I wanted to see since mountains and hiking aren’t really his thing. Armed with the knowledge of my "surprise" trip location, I started planning. 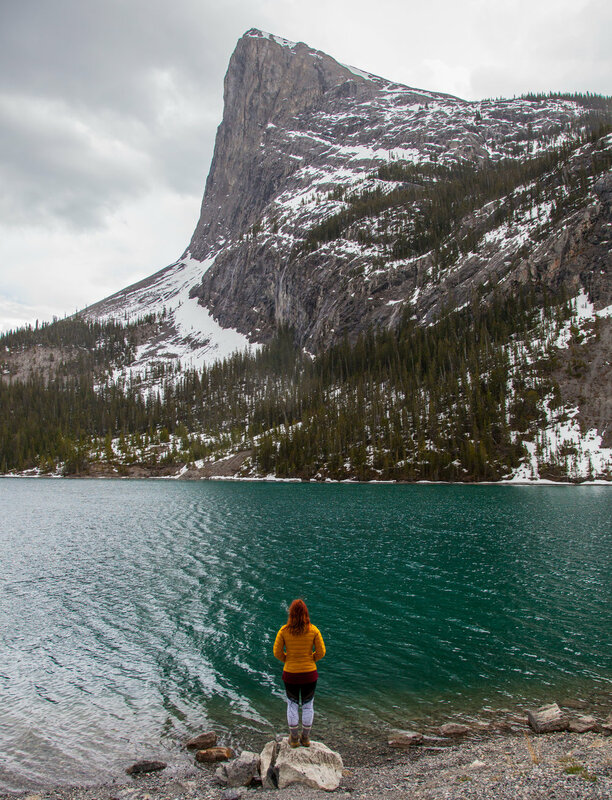 May is a good time to see Banff when it's less crowded and on the cheaper side. You won't see the picture perfect Gatorade colored lakes (they are still frozen!) but there are still a ton of beautiful things to see! Not the view I was hoping for, but safety first! We took some photos at the lake below the hike and went onwards to check in at our hotel and check out Downtown Banff. Spring is a great time to visit if you are looking to save some cash and are okay with some destinations being closed. We used Hotel Tonight and were able to find a room for $70 a night in the center of town. After dropping off our stuff we headed over to Two Jack Lake and Lake Minnewanka. Immediately upon arriving in the parking lot for the Two Jack Lake viewing point there was a group of grazing Big Horn Sheep…and a crowd of tourists (including me) photographing them. Brian was very surprised that they pooped little pellets instead of giant poops. You learn something new about nature everyday! We poked around Lake Minnewanka for a bit while Brian attempted to break the ice by throwing rocks at it. It was still very thick and he failed at his quest. Eventually a thunderstorm rolled in so we got back into the car and headed into town for a steak dinner at Chuck’s Steakhouse. 100% recommend, but maybe get a reservation so you don't have to sit at the bar like we did. You see that large rock sitting on top of the ice? Brian threw it down there moments earlier...he was very disappointed when the ice didn't break. The next morning I really tested Brian’s love for me and woke him up at five in the morning so we could drive to Vermillion Lakes for sunrise. It was still slightly overcast so I was unsure if I would even get any good photos, but I was determined to try. When we got there I was even more worried because I was the only photographer out there on a Saturday morning…definitely didn’t bode well for a super lit sunrise. My perseverance paid off though! First, I won in a battle with some aggressive geese for the best viewpoint for sunrise. Second, after 20 minutes of sitting in the cold, the clouds near Mount Rundle lit up in a gorgeous shade of pink! I had a battle of wills with two aggressive territorial Geese to claim this spot for sunset...meaning I just kept creeping closer until they honked at me and flew away. It was really intense. When the color display died down I woke Brian up from his nap in the car…poor guy. We headed to Tim Horton’s for some coffee and doughnuts. This is where all the Canadians will hate me, but Tim Hortons is not good. Dunkin is WAY better. There, I said it. I regret nothing. Back to the trip, this is when our plans changed up a little bit. 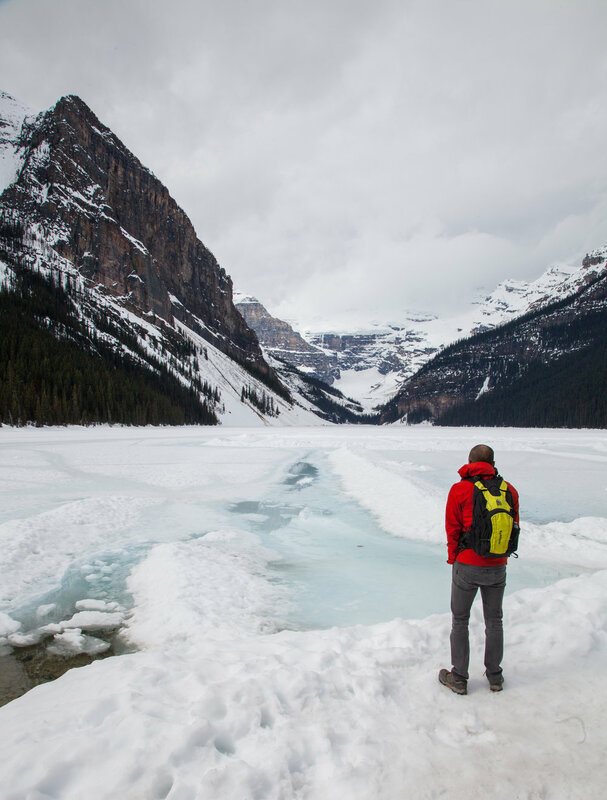 I had originally planned driving up the Icefields Parkway after hitting up Lake Louise. Unfortunately it had been closed down due to a large avalanche :( I was pretty bummed because there were a lot of places I wanted to see along the Icefields Parkway, but this is just how traveling goes sometimes! You have to be willing to be a bit spontaneous. 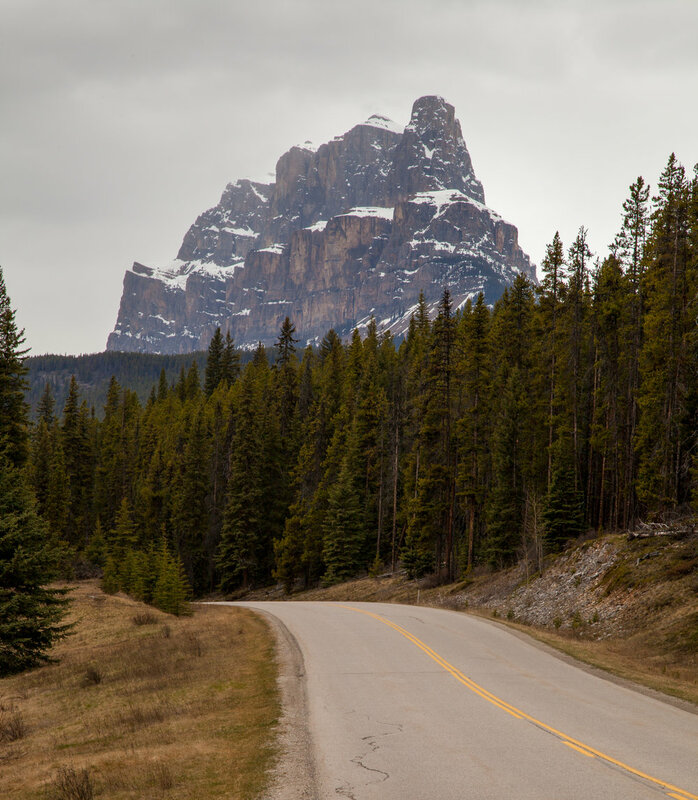 We turned around and hit up the Bow Valley Parkway instead. It was a gorgeous drive and we spent some time exploring Johnston Canyon. If I were to do Johnston Canyon again I would plan it more and get there much earlier. The trail was still snow and ice covered in spots and we watched a lot of tourists in highly inappropriate footwear (high heels, slip on vans, etc) grasping onto the railing for dear life. This also meant we were stuck behind them, and nothing turns me into a rage monster more than being stuck behind slow people that don’t know what they are doing on a trail. Don’t be dumb like me, get there early. I didn't even take any photos while we were in the canyon, I was too annoyed with everyone around me to take out my camera. RAGE MONSTER. We returned to Banff a earlier than expected so we decided to hit up Vermillion lakes again for sunset after we ate dinner. Driving down the road to the viewpoint, people driving the opposite direction kept waving at us to slow down. Since we were already driving under the posted speed limit so we were a little confused. Then we turned a corner and suddenly saw a large Grizzly Bear snacking on the side of the road! I knew Grizzlies were common in the area but I really wasn’t expecting to see one on this trip. It was such a pleasant surprise! We stopped the car and I pulled my camera out of my bag to try and get some shots (from inside the car, I promise I am not dumb) Unfortunately it was still on long exposure settings from earlier and the Bear crossed the road and wandered closer to the lake before I could fix them. I managed to get a couple of shots when it was further away, but had no zoom lens with me so you will have to squint to see the Bear in the distance haha! This color combo doesn't even seem real! Sunday was pretty chill. We woke up and went to brunch at Tooloulous before driving back to the airport for our flight. Definitely get the New Orleans Skillet, the pancake was the best pancake I have ever had in my life. It somehow didn't even need syrup. I am still confused and amazed by that pancake. Overall this was a great first trip to Banff and I am excited to get back there in the summer to see the lakes melted! I also want to get some more hikes in and drive up the Icefields Parkway/into Jasper national park since I missed it this time around! Brian and I often jokingly compete to prove who loves who more, I know, mushy couple nonsense. After this trip, Brian kind of wins at our game for a while...That is until I come up with something even better. Then you know I will be screaming, “I LOVE YOU MORE!” at him. You win for now Brian. FOR NOW.